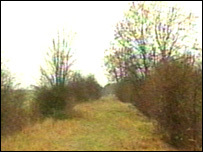 A study is being conducted to see if a disused rail line between Cambridge and Colchester in Essex could be restored to serve commuters. Campaigners say demand is high, and they propose a re-opened line could also be used to move freight from North Sea ports to the east of England and the Midlands. Consultants Wilson, Lee and Partners are looking at the feasibility of a route between Cambridge and Haverhill in Suffolk, but campaigners hope the end result will stretch to Colchester. Julian Blackmore, with the consultancy, said: "Given that more than 10,000 people signed a petition just over two years ago, I think it's highly likely there is a lot of public support. "But of course we've also got to show whether or not it's economically feasible, and, we've got to look at the engineering problems as well." The consultants plan to look at other reopened lines in the region - like that between Wymondham and Dereham in Norfolk. The study was commissioned by the Cambridge to Colchester Railway Development Company, with funding from the St Edmundsbury Borough Council and Suffolk County Council. If the results are favourable, the line could be running in as little as two years.